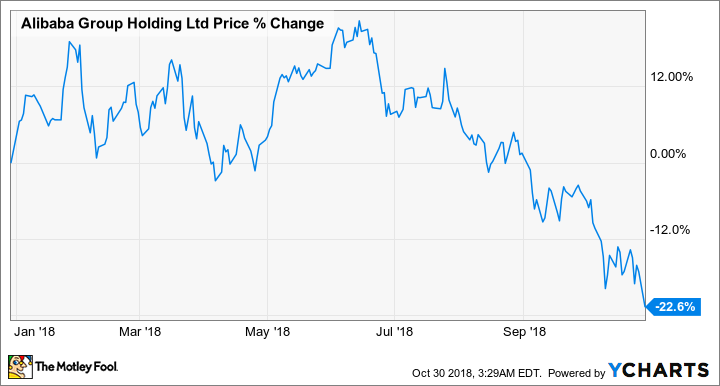 Alibaba's stock is down about 30% since it reported earnings fiscal first-quarter 2019 earnings. Alibaba (NYSE:BABA) is in need of a strong second-quarter report. The Chinese e-commerce giant's stock has fallen nearly 30% in the past three months, largely due to concern about the slowing growth of the Chinese economy. However, heavy investing and one-time expenses also weighed on the company's net income and margin last quarter. If you want to know whether Alibaba's performance improved in the second quarter, you should check on the following four main metrics in the company's financial report, which will be released on Nov. 2. Alibaba has a lot to prove after a disappointing previous quarter. Image source: Alibaba. Alibaba's revenue growth has been soaring in recent years. Last quarter, the company's revenue was up 61% year over year, to 80.9 billion yuan ($11.8 billion). This marked the company's eighth straight quarter of revenue growth over 50%, so investors will be eager to see if it can maintain this trend for the fiscal second quarter of 2019. Investors also will be comparing this quarter's revenue growth to the year-ago period, when Alibaba reported 61% year-over-year growth, to $8.3 billion in revenue. Hopefully, the company can either match or top that growth. While Alibaba isn't really thought of as a social-media platform, the number of active users on its e-commerce app provides an important indication of its success in China. That's because the organization uses entertaining and informative content on its app to draw users in and encourage them to shop on its e-commerce platforms. In fact, Alibaba has told investors that the more time users spend on its app, the more money they spend on its platform. In the first quarter, Alibaba's monthly active users reached 634 million, up 17 million more than the previous quarter. In addition, the company reported 576 million annual active consumers, up 24 million over the twelve-month period ending in March. It's important for investors to see that Alibaba can to continue this momentum in its app engagement growth story, since it's so closely linked to consumer spend. Alibaba's net income raised some eyebrows last quarter when the company reported that earnings per share plummeted 41% to 8.7 billion yuan ($1.3 billion). The company claimed that without a one-time stock-compensation charge associated with its financial arm Ant Financial, net income would have actually increased 33% year over year. This quarter, investors will be looking for Alibaba's net income to return to the upward growth it was charting before last quarter. For the quarter ended in March (the last quarter of the 2018 fiscal year), Alibaba's net income attributable to shareholders increased 47% on a year-over-year basis. Another sensitive area for Alibaba is its margins, which have been squeezed lately due to heavy investing. In the first fiscal quarter of 2019, Alibaba's operating margin dipped 10%, down from 15% and 31%, respectively, in the two previous sequential quarters. Alibaba attributed its most recent margin dip to the share-based compensation expenses that also dragged down its net income for the period. However, the organization has also upped its spending this year to invest in new initiatives. In March, Alibaba invested $2 billion in Southeast Asia e-commerce platform Lazada. Alibaba owns 83% of privately-held Lazada, and this recent investment brought its total investment in the company to $4 billion. The following month, Alibaba acquired China's biggest food-delivery company, Ele.me, to help it increase share in China's $32 billion food-delivery market. And this summer, Alibaba launched a $3 billion marketing campaign on behalf of Ele.me to help it reach over 50% market share in China. Alibaba continues to invest heavily in its "New Retail" strategy, or the use of data and technology to help update (and save) brick-and-mortar stores. While these projects are costly, Alibaba believes they will be worth it over the long term and claims that they're already making "meaningful contributions" to the company's China e-commerce revenue. This latest quarter is a chance for Alibaba to report a more encouraging net income figure while also continuing to show positive growth in its revenue and active users. Margins most likely will continue to be squeezed as Alibaba focuses on long-term growth areas. And if Alibaba executives read the room correctly, they'll be sure to address concerns about China's slowing economic growth to reassure investors that they're in good hands.